Following Wednesday night's call, the correct replacement modem arrived today- just one business day after calling, and two days ahead of their ETA. Of course, it didn't work when I initially plugged it in, but that's not unusual when you replace a cable modem with a different model. Ten minutes going through a recording reciting the obvious- make certain everything's connected, disconnect and reconnect to modem to the power line, etc.- and I was connected with a tech who did a reset from his end. Two minutes and we were back on the air. 80 meg/sec download, 10 upload. Not too shabby. I have to admit that while Comcast engages in lots of irritating customer behavior- lots of recordings, punching in numbers- trying to get me to buy a pay-for-view wrestling event(!? )- when you finally do get to a real human, they solve things quickly, are pleasant, reasonable, and quite accommodating. And this has been my consistent experience for the past two years or so. Just lose the pay-per-view sports messages that pop up on the cable box, ok? If I was an ultimate fighting fan, believe me, I'd know when the next big event was occurring. 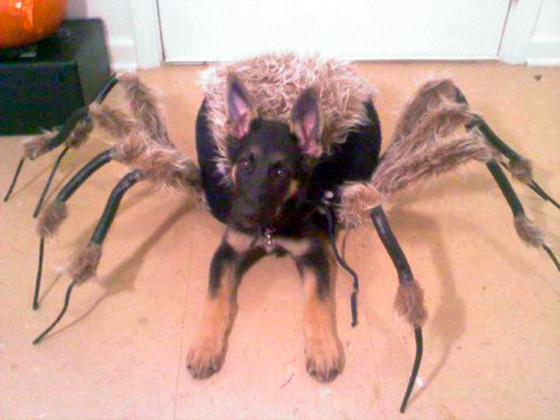 You've heard of the wolf spider, but how about the spider wolf? Categories: Animals, Dogs, Holidays, Photo of the day, WTF?